Billy “Uke” Scott- William Scott was born in Sunderland. As a child, he took piano lessons and then became a young singer with a jazz band. He made his variety debut aged 13 at the Empire in Newcastle. During World War II, Scott worked for ENSA (Entertainments National Service Association) and established himself as a versatile artist. He appeared in the films Rainbow Round the Corner (1943) with the organist Robin Richmond and A Night of Magic (1944). His preferred choice of instrument was the traditional wooden ukulele because of its sweeter sound, rather than the more strident banjolele favoured by George Formby - though he played both. In many performances, Scott tuned the third string of his ukulele an octave higher. This is a limitation to his playing style, as many melodic passages could not be executed fully. Ernest Kaai- He was the first Hawaiian-born virtuoso ukulele player and was a figure in the Hawaiian music world in the first quarter of this century. Besides being adept at the ukulele, Kaai was also a superb violin, guitar and steel guitar player. By the age of 19, he was playing in and organizing ensembles. At one time, he had as many as 12 bands playing in the Islands. He not only promoted Hawaiian music in Hawaii, but on the mainland as well. But it was as a ukulele player that most remember Kaai. 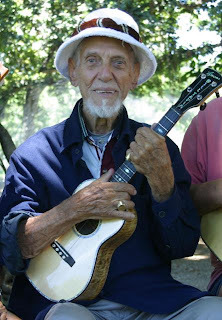 It was Johnny Noble, Hawaii's greatest composer, who said Kaai was "Hawaii's greatest ukulele player". 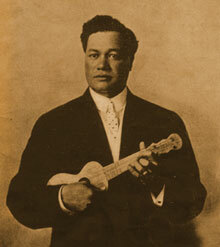 Due to his musical ability, he is credited with making the ukulele into a featured instrument in Hawaiian groups. He also published the first ukulele instruction book, "The Ukulele, A Hawaiian Guitar", published in 1916. This book presented the ukulele as a sophisticated musical instrument and included exotic chords and and complicated strums. In 1940, Kaai retired to Miami, Florida, where he opened a music store and performed off and on. Eddie Kamae- He was 14 years old when his brother brought home a ukulele he had found on a Honolulu city bus. He knew no chords and had no idea how to play it, but he loved the sound it made. He learned whatever he could from his brother, other musicians, and from books. Within a short time he was one of Hawaii's greatest players and started experimented with new ukulele techniques, stretching the ukulele to it's full potential. In the late 50s and early 60s, Kamae became immersed in his own culture, studying the old ways of Hawaiian music. He founded "The Sons of Hawaii", with fellow Hawaiian musicians Gabby Pahinui, David "Feet" Rogers and Joe Marshall. Bill Tapia- He is the innovator of 'ukulele jazz and the proverbial "hardest working man in show business, this Honolulu native has performed with such famed Hawaiian musicians as King Bennie Nawahi, Sol Ho'opi'i, and Andy Iona, and crossed paths with a sparkling list of entertainers, from Mary Pickford and Clark Gable, to Louis Armstrong and Bing Crosby, to Marilyn Monroe and Shirley Temple, and even to Elvis Presley! The list reads like who's-who of 20th- century pop-culture icons. Bill, with his incredible memory and dramatic flare for storytelling, still vividly recreates with ease these often mischievous and always entertaining encounters. Jake Shimabukuro- His speed of light playing and his great stage presence have propelled him to the top of the 'ukulele hierarchy in just a few short years. He has several solo albums out and they are awesome. 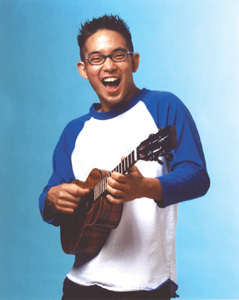 Shimabukuro's appearance dramatically altered traditional perceptions of 'ukulele music. Playing with incredible technique and great feeling, he covers all types of music from Hawaiian to classical, jazz, rock, blues, funk and of course, improvisation that comes naturally to the ukulele. 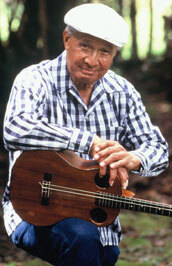 Shimabukuro continues to be a source of inspiration to the Hawaiian music scene.